In the age which prospers well in the electronic products, mobile phones have become a ubiquitous part of people's daily life, enabling people to be connected regardless of location, play games and watch videos anytime and anywhere. Among numerous mobile brands, Nokia doubtlessly has always been the most famous one having a mass of users, attributing to its high productivity, excellent quality, reasonable price and robust functions. In recent years, the smartphone brand may be lagging behind the global competitors like Apple and Samsung, but a Nielsen marketing research indicates that Nokia is the top choice for consumers in the dual SIM category in India, and Economic Times Brand Equity survey shows that Nokia has retained its top spot in the Most Trusted Brands in the 2012 list. Now, it is counting heavily on its new Lumia smartphone line, powered by Microsoft’s Windows software, to regain its lost ground. Nokia phones, N Series, E Series, X3 and X6 included, generally feature high speed data, stereo speaker, megapixel resolution and great battery life, furnishing users with splendid entertainment experience, like watching video and movies thereon. Just as never a rose without a prick, Nokia is no exception. Its phones, similar to HTC, Apple iPhone and Samsung Galaxy, do not have a built-in DVD-ROM or DVD player for the playback of DVD movies. As a result, if you want to play DVD movie on Nokia phone directly, you may quickly find your DVD won't play directly on the phones. For the sake of playing DVD movie on Nokia, you could count on a special DVD ripper to digitize DVD to Nokia compatible format like MPEG4, H264, 3GP, AVI, XviD first. Here, MacX DVD Ripper Pro, which is highly acclaimed by its users for high ripping speed and stunning video quality, would be your first choice. Equipped with the brand new advanced DVD encryption analysis technology, this top-ranked DVD ripper can rip protected DVDs to Nokia phones like a hot knife through butter. Thanks to its wizard-like interface, both novices and veterans can finish DVD conversion in one fell swoop and then freely play DVD movie on Nokia. This DVD ripper has two versions for users. For Mac users, you can simply download Mac version DVD ripper; For PC users, you can choose the DVD ripper for Windows(Win 10 supported) to convert DVD to Nokia on PC. After free downloading the DVD to Nokia ripper on Mac computer, click "DVD Disc" button to import DVD, or you can upload DVD disc by hitting "DVD Path" button. 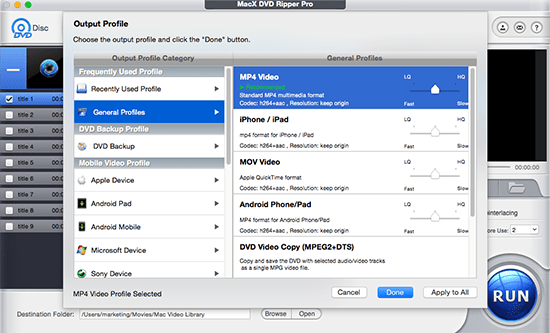 The DVD ripper can also copy new movies on DVD. Since you want to convert DVD to Nokia, you can go directly to "to Nokia" from the Output Profile drop-down menu and then choose one video format from the pop-up list based on your need. For advanced users, you can also adjust the parameters, such as video codec, video bitrate, frame bitrate, resolution, audio channel, etc, as you wish. Tips: The DVD ripper for Nokia not only works well in ripping DVD movie to Nokia but also provides omnipotent ability to rip and convert DVD to iPhone, iPad, Blackberry, Google Nexus 7, PSP, etc. Click the "RUN" button to start to rip DVD to Nokia recognized video on Mac. After the conversion process is finished, you can transfer the converted DVD to Nokia phone via USB so as to play DVD movie on Nokia anytime and anywhere. Note: Besides helping users play DVD movie on Nokia, this DVD ripper for Nokia also features a unique DVD copy function to allow users to make an impeccable DVD backup on hard drive with original video-audio quality, keeping DVD safe and complete all the time. Tips for iOS users: you can download free but feature-rich file transfer software, MacX MediaTrans to sync the movie file to iPhone iPad etc. Meantime, it gives you plenty of control over video file transfer, edit, management. Notice: We only advocates using this best DVD ripper to rip commercial DVDs to Nokia under the concept of Fair Use and does not encourage any illegal reproduction or distribution of copyrighted content. Please abide by the local DVD copyright law before doing it.